Several years ago, as part of my Project 200 build, I reviewed the Nemesis and the Lightforce LED215, which was then the top LED driving light on the market (along with the ARB Intensity). 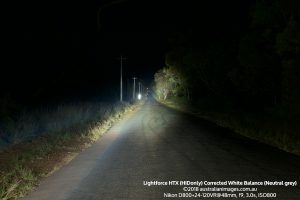 With the subsequent arrival of the Lightforce HTX -a hybrid HID/LED driving light- I had a lot of requests to do a new review and comparison against the Nemesis, but never had the opportunity to do so, until now. 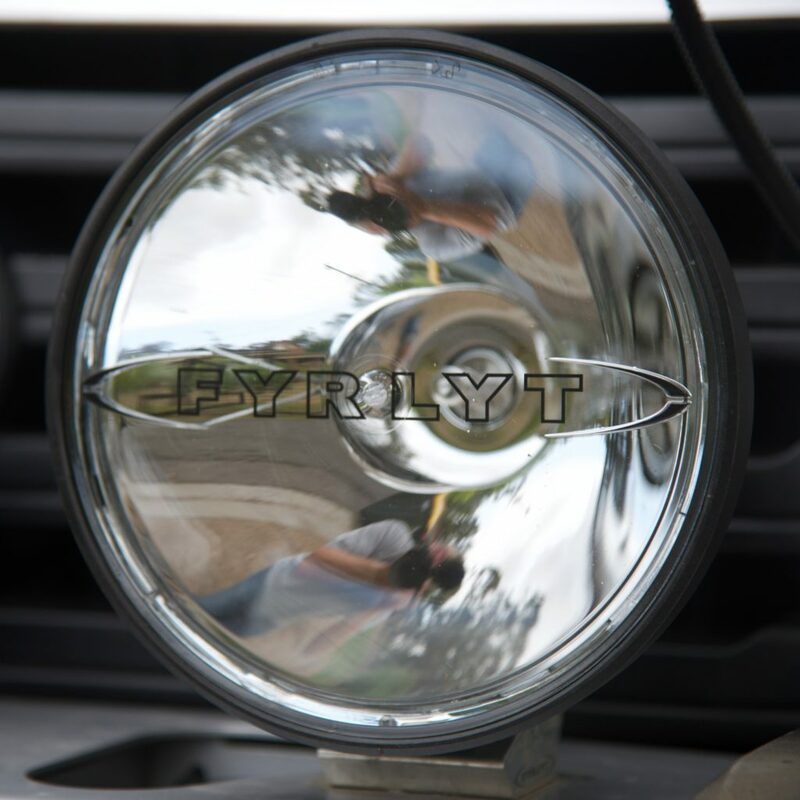 The Fyrlyt Nemesis is a traditional style driving light, bucking the HID and LED trends for a German-made 24-volt, 250-watt halogen globe. This is located within a 210mm composite housing, with a Goretex vent and a polycarbonate lens. The body of the light has a billet aluminium mounting foot and globe holder/heat sink. The reflector is plated aluminium. All of the components are replaceable, with the lens and globe easily changed in under a minute, without tools. 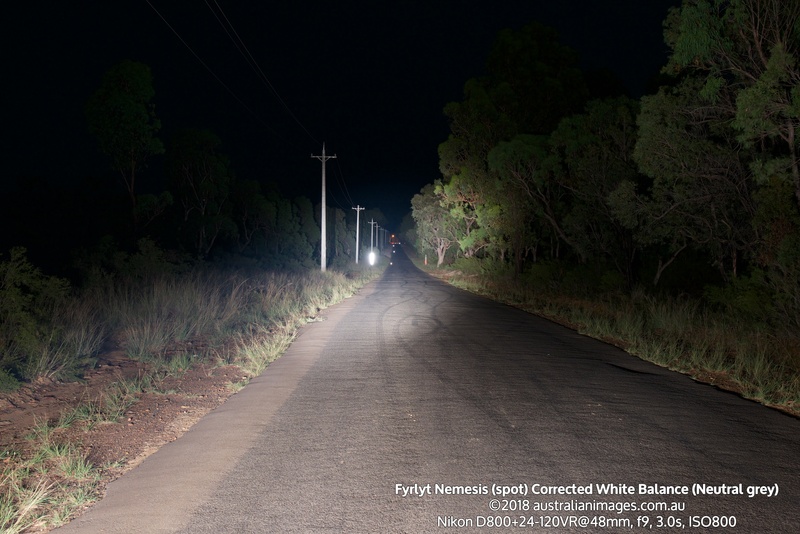 The Nemesis has a colour temperature of around 3400ºK, and a claimed Colour Rendering Index of 100. 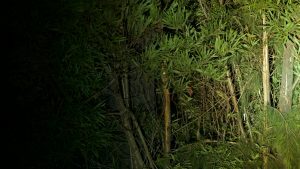 When fitted to 12-volt vehicles, the Nemesis lights include 12-24v transformers to provide the lights with the required 24 volts. The transformers are mounted remote to the lights, typically within the engine bay. Total current draw is 22-amps per light. At the time of writing, the Nemesis RRP is $990 a pair for the 12-volt versions, or $630 a pair for the 24-volt versions (no transformers supplied). You'll also need a heavy duty wiring harness. If you wire the lights yourself, ensure you use appropriate cable using a voltage drop calculator, limiting voltage drop to <1v. 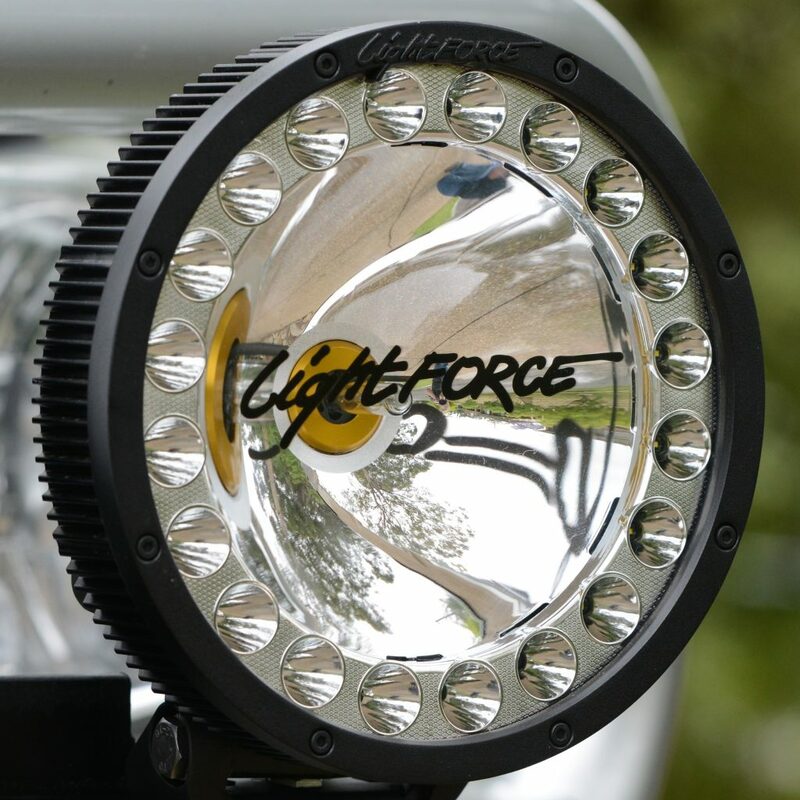 The Lightforce HTX is a 'hybrid' light, featuring a 170mm centre reflector with a 70-watt HID light source. This is surrounded by 20x 4-watt LEDs, for a grand total of 150-watts per light. 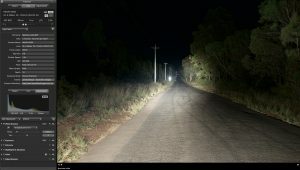 The two sections are switched independently, with the HID providing a long-range pencil beam, and the LEDs providing a short range wide beam. With both sections operating, they draw 11 amps per light. The HTX is contained within a sealed metal/composite housing, with a Goretex vent. It has a composite mounting foot. In standard form, the HTX has two different colour temperatures: 4200ºK from the HID, and 5000ºK from the LEDs. Optionally, you can specify a matching 5000ºK HID. The HTX has a claimed Colour Rendering Index of 70. At the time of writing, the HTX RRP is $1598.00 a pair for the 12-volt versions, or $1698 a pair for the 24-volt versions. The HTX requires a DL230 LFDLHDS wiring harness to switch the two sections of the light. In the interests of full disclosure, readers should be aware that Fyrlyt have asked me to conduct this comparison. They gave me the Nemesis lights several years ago at no cost (which I'm still using), and they have loaned me the pair of HTX lights for the testing (I'll return them when I'm done). They also provide my son with some karting sponsorship. All that said, I'm not employed or contracted by Fyrlyt and they had zero input into the testing methods, content or results. I have endeavoured to make the testing completely transparent and repeatable. 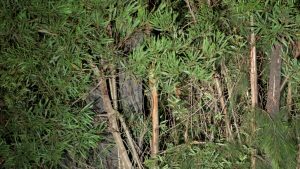 The still images below were taken in Nikon NEF raw format, and can be downloaded to verify the exposure settings are the same for all images. I left my Nemesis lights fitted to the vehicle, running the original wiring loom. I then fabricated some temporary brackets for the HTX lights, and attached them to the bullbar next to the Fyrlyts. They were wired using the standard Lightforce LFDLHDS wiring harness. The HTX lights obstructed the factory high-beam lights, so these were disconnected for all of the testing (video and still). I fitted a GoPro Hero 6 Black to the LandCruiser, recording in 1080/25p mode. I then went for a drive on a few local rural roads, switching between the Nemesis and the HTX lights. 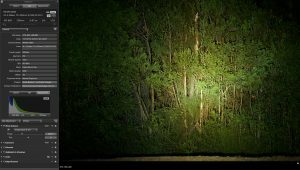 The camera was manually locked to a shutter speed of 1/25th second and an ISO of 1600. 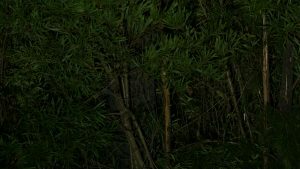 This is extremely important, as it means the camera does not compensate for different light levels by auto-adjusting exposure. With most vehicle lighting comparisons, the camera's auto-exposure mode makes the comparison worthless, because it automatically adjusts to allow for the different light levels. 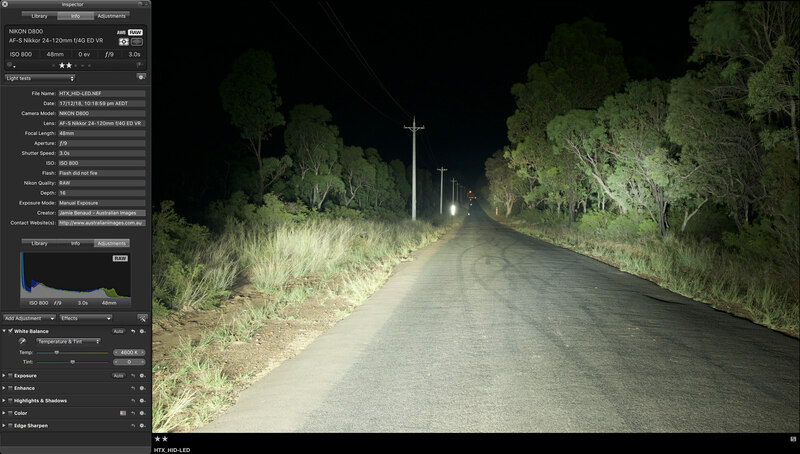 For the 'road' still images, the vehicle was parked, with the engine running at ~1000rpm. The factory lights were off or completely covered, so the only light source was the driving lights being tested. Be aware though, that this isn't truly representative of real world lighting performance, because the vehicle headlights will normally add to foreground lighting, as you can see in the video above. 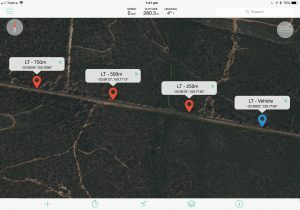 For the testing, traffic cones were placed at distances of 250, 500 and 750 metres, as shown on the map image. 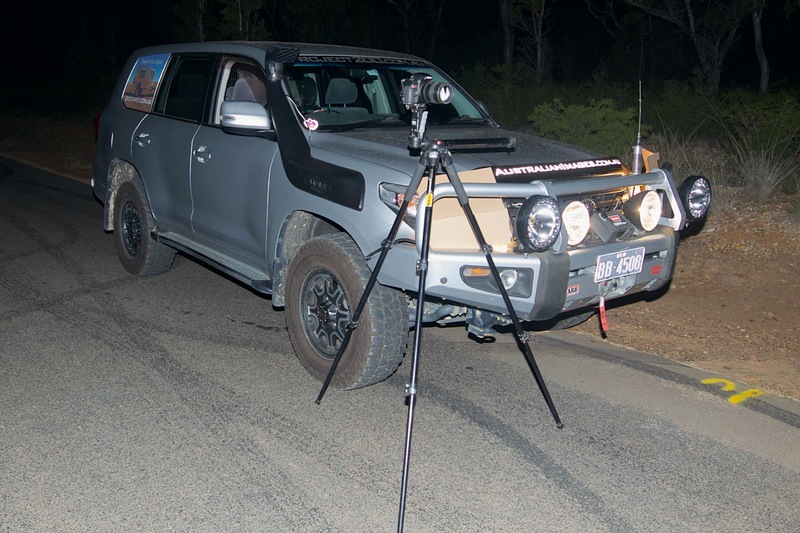 A Nikon D800 camera and Nikkor 24-120 ƒ4 VR lens was placed on a tripod just to the side of the LandCruiser. 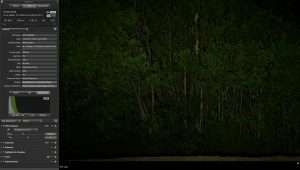 The camera was manually locked to a shutter speed of 3.0 seconds, an aperture of ƒ/9 and an ISO of 800 for all of the images. Focal length was 48mm. 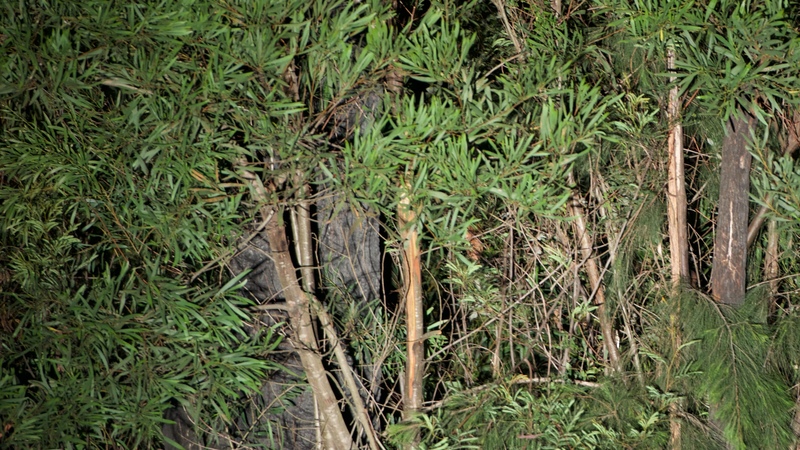 The 'foliage' still images were taken at a range of approximately 50m. The vehicle was parked, with the engine running at ~1000rpm. The factory lights were off or completely covered, so the only light source would be a single unit of the light being tested. A Nikon D800 camera and Nikkor 70-200 ƒ2.8 VRII lens was placed on a tripod just to the side of the LandCruiser. 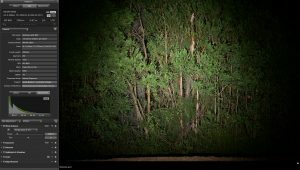 The camera was manually locked to a shutter speed of 1/20 second, an aperture of ƒ/4 and an ISO of 800 for all of the images. Focal length was 200mm. For all tests, the camera was set to shoot NEF-RAW 12-bit lossless-compressed. 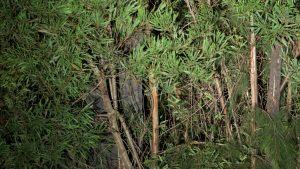 The images were then imported into Apple Aperture software using its standard raw processing algorithms. No adjustments were made, other than to white balance as noted below. The unprocessed RAW images can be downloaded below. You may require specialised software to open them, and there may be slight variations in the result depending on the software used. These images give an idea of the light provided by there Nemesis and HTX in isolation (headlights off/covered). 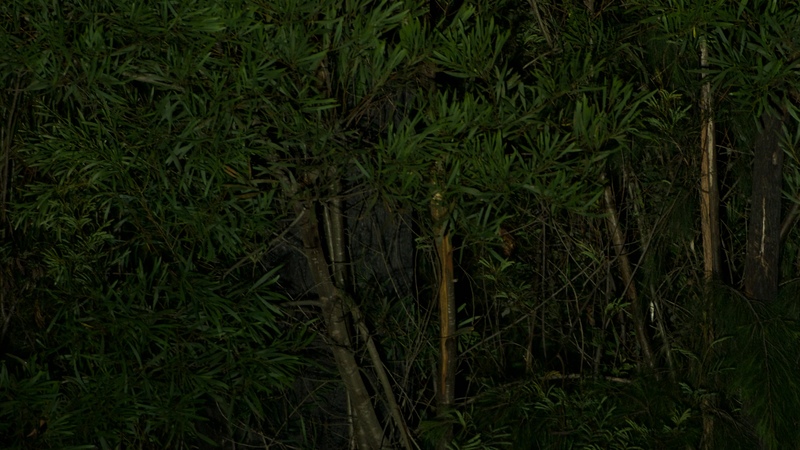 Click any image below to open full-screen. 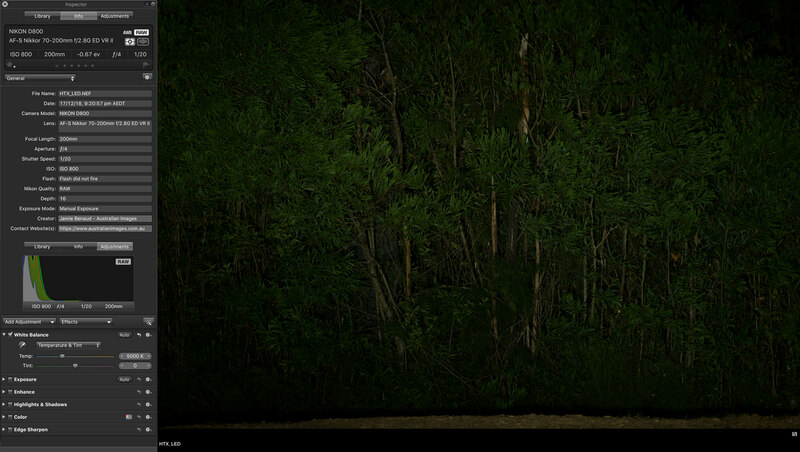 Download zip of all full size images here. Shown with white balance corrected using neutral grey. This makes colours the same for all lights, even if that's not how they really look. Not too much that's surprising in these images. As seen in the video, the HTX shows more light than the Nemesis in the short range when the LEDs are operating (both alone and in combination with the HIDs). The difference between the HTX and the Nemesis in the short range is highlighted by the exclusion of the vehicle headlights for the still images, so the video actually gives a more realistic picture of the performance during real-world driving conditions, since you always run with your headlights plus the driving lights. One strange observation from the images, is that the HTX shows more foreground light with only the LEDs operating than with both LEDs+HIDs operating. 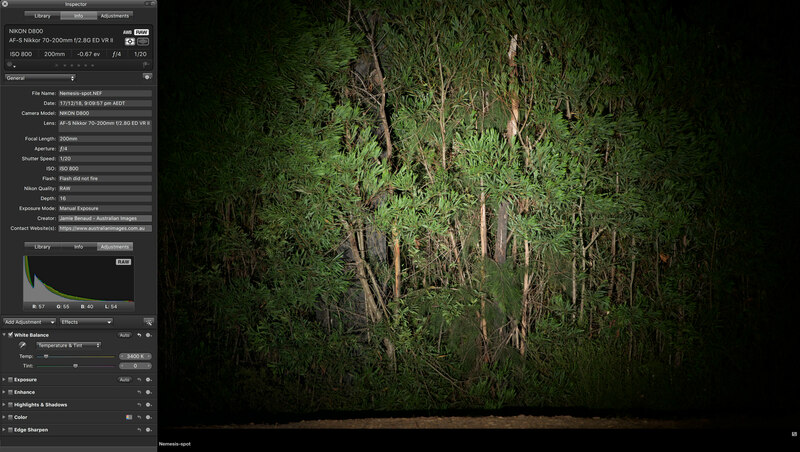 Given that the images are RAW and use exactly the same exposure/settings, I can't readily explain this difference. 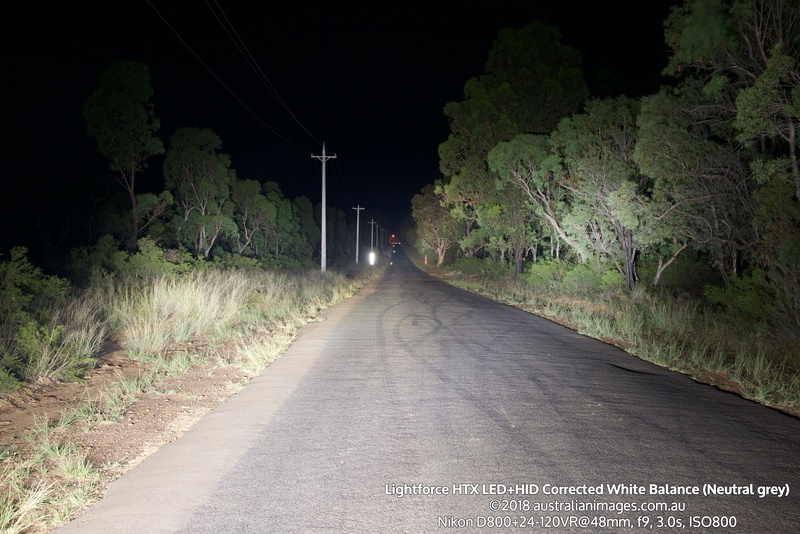 It could be that the LEDs are actually less bright when the HIDs are active, perhaps due to total current draw. 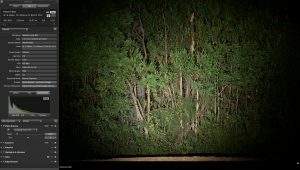 Or it could be a background/unseen adjustment either in-camera during the image capture or in the handling of the RAW files by Aperture. 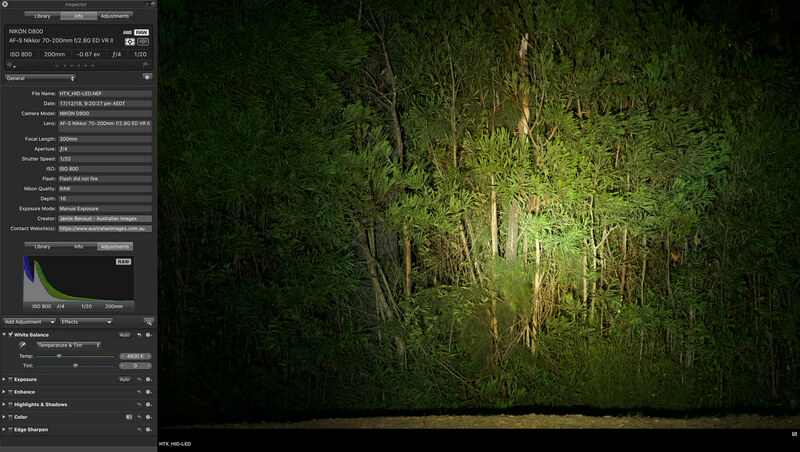 These images (from a single light in each case) give an idea of the pattern, colour and contrast from each light. While both the HTX and Nemesis are high quality products that produce huge amounts of light, the way they deliver that light is vastly different. Using a halogen light source is often considered 'old tech' these days, but the quantity and quality of light produced by the Fyrlyt Nemesis lights really is excellent. They are a long way removed from the old 100w halogen driving lights of the past. 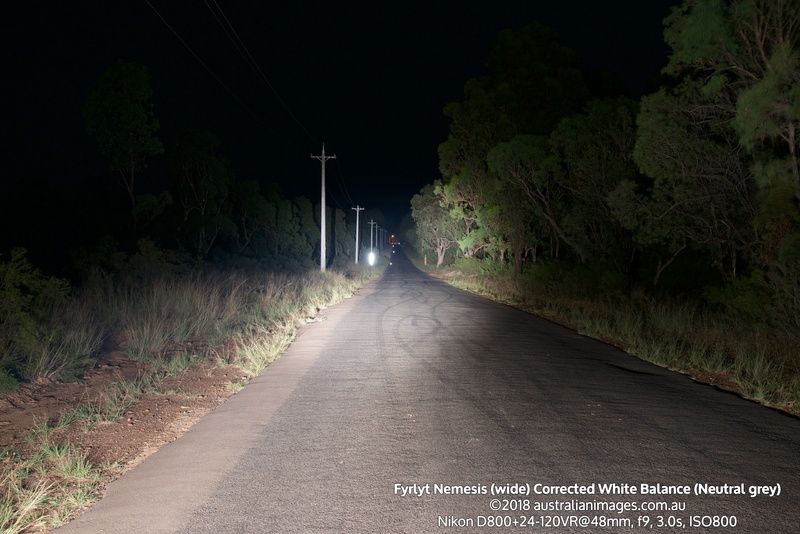 The Fyrlyts deliver a large amount of natural-looking light. It's particularly good at mid-range distances of 100-400m, where it illuminates the sides of the road with excellent contrast. I generally run my Nemesis with both lights on the 'wide' setting with some overlap at the centre, which I find produces a better light in the most useful distances (with a slight sacrifice of absolute range compared to the spot setting). I've been running the Nemesis on the LandCruiser for over three years. The casings and reflectors are all still in excellent condition. The lenses have some minor pitting from sand and bugs, and I replaced them before conducting this test in case performance was affected. But I wasn't able to see any difference after changing them, and will keep the old lenses as spares. I'm still running the original globes, which is pretty impressive. The current draw of the Nemesis is substantially higher than most other lights. However, on most modern vehicles it's not anything to be concerned about. A pair of Nemesis lights will draw a total of 44 amps (compared to 22 amps for the HTX). But to put this in perspective, the LandCruiser 200, Ford Ranger and Mazda BT50 all have 140-amp alternators. The Toyota Prado/Hilux/Fortuner are all 100-amps. So a pair of Nemesis lights doesn't come close to exceeding the capacity, even assuming there are numerous other accessories running. It is a factor worth considering if your vehicle has a low amperage alternator, however. 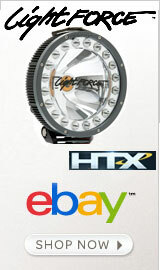 The HTX clearly delivers more light than the Nemesis in the short/wide range thanks to its LED ring. 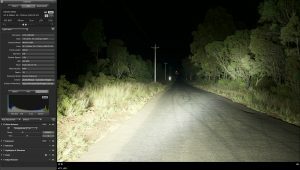 In fact, with just the LEDs active, it's a very nice light for use off-road and on tight winding roads where the HID section (and the Nemesis) produce excessive reflection from road signs/chevrons. 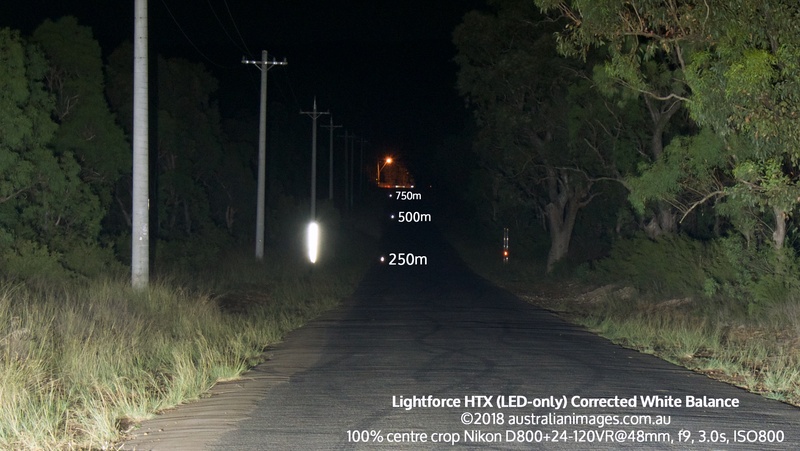 Conversely, the beams produced by the HID sections of the HTX are extremely narrow. So narrow that I found them very unpleasant to use in the absence of the LEDs. 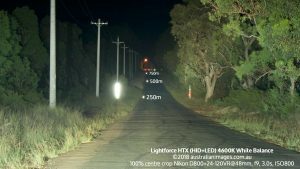 I can't imagine a situation where you'd want to run with just the HIDs. It's also worth mentioning here (for those who haven't used HIDs before) that HIDs do not turn on instantly like LEDs and halogens. They come on slowly, taking around 20 seconds to reach full brightness. 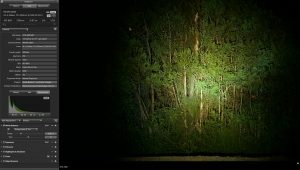 This can seem like an eternity if you need more light quickly and haven't had them on for a few minutes. With both LED and HID active, the HTX delivers a lot of light. It's maximum useful range is around the same as the Nemesis, but with a far narrower beam once you move beyond the useful range of the LEDs. In the mid range of around 200-500m, it lags slightly behind the Nemesis, particularly towards the sides of the road. 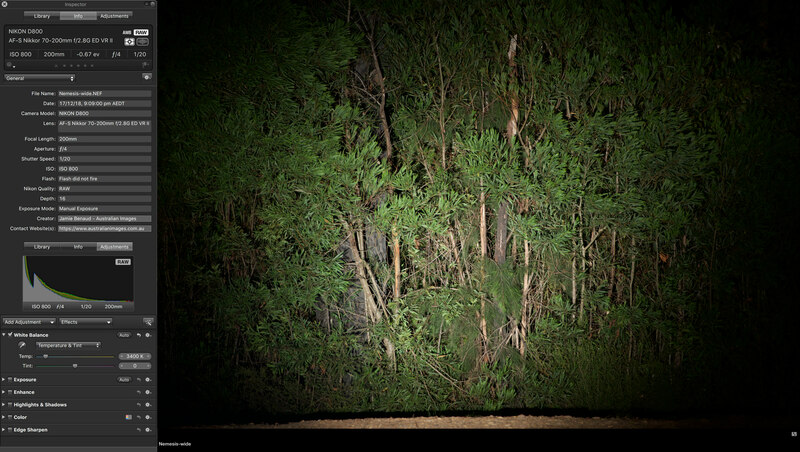 You can see how narrow the beams are looking at the 'foliage' images above. 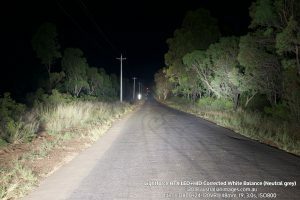 Unfortunately, the 'road' images don't show this particularly well, because the bush being right next to the road masks how narrow the light field is once you exceed the range of the LEDs. 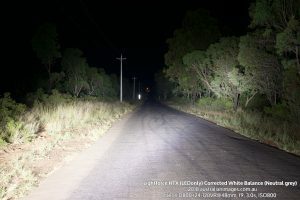 Despite misgivings before the testing, I didn't specifically find the different colour temperature of the HID and LED sections to be an issue, but as I observed with the LED215s tested previously, the cool white light of the HTX certainly produces poorer colours and less contrast than the warm light of the Nemesis. While the Nemesis has a Colour Rendition Index of ~100, the HTX's is a much lower 70, which probably explains this to an extent. 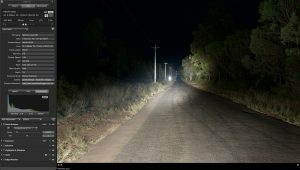 Over the time I was testing these lights, I had the opportunity to drive behind the HTXs on 80-100km/h rural roads for periods of up to an hour at a time, late at night. Although they produce plenty of light, I found that they were quite tiring to drive behind compared to the Nemesis. I can't be positive of the reason(s) for this, although I suspect it comes down to two factors: The first is the colour temperature/CRI. The second factor, I believe, is the high levels of short-range light delivered by the LEDs, which heavily illuminate the area right in front of the vehicle (in the first 50m or so). 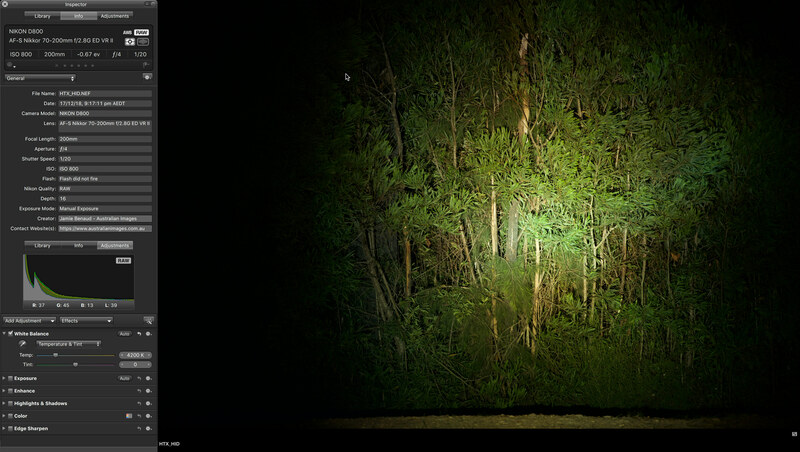 This is somewhat distracting when travelling at highway speeds, as you find your eyes constantly refocussing and adjusting from close to far and bright to (relatively) dim. If I were to pick one more undesirable 'feature' of the HTX, it would be the mounting foot. It's made of a composite plastic material, which flexes, causing the light to move and vibrate if you use only the primary mounting bolt. The solution (as recommended by Lightforce) is to install secondary bolts into the provided holes on each foot, meaning three mounting bolts per light. At the very least, this means drilling additional holes in your bullbar, but if using a bar with light-mounting tabs, it's generally not possible to use the secondary holes as they sit in mid-air. 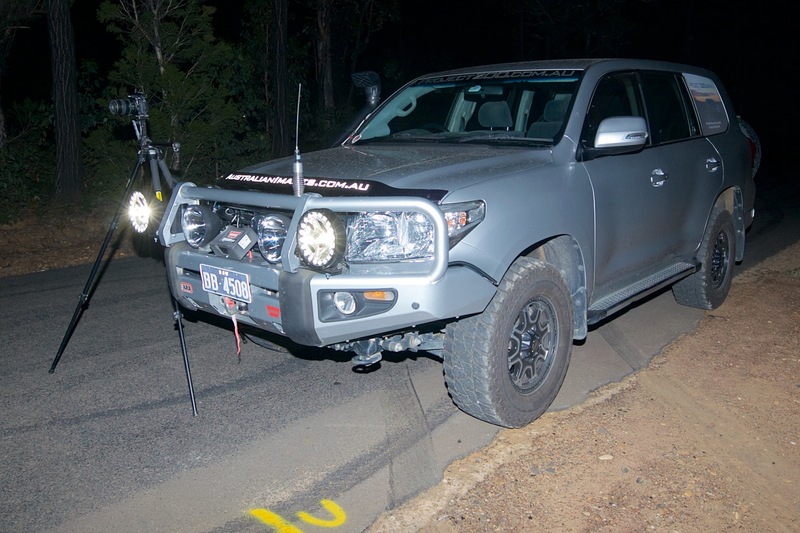 I'm not sure why Lightforce have used plastic for the foot, but I'd guess it was to create a 'sacrificial' component to protect the light during impacts. Whatever the reason, I'm not a fan. When I first saw the HTX, I was impressed. 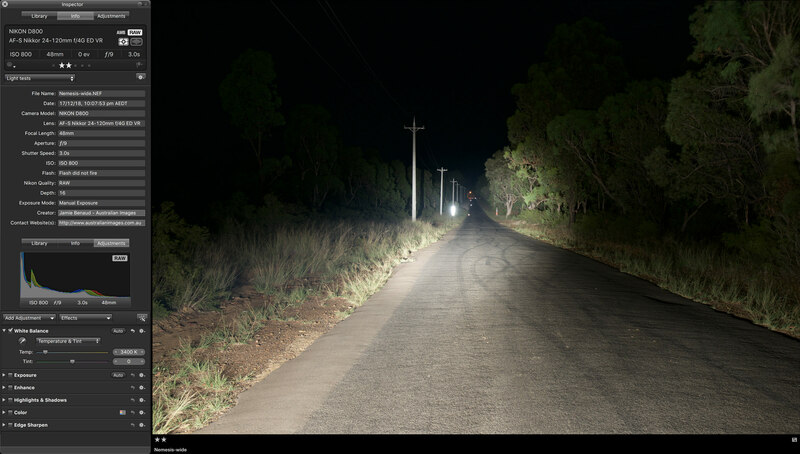 A light that combines the long-range of a traditional HID or Halogen driving light, with the short-range spread advantages of LED. But in practise, the HTX doesn't quite live up to my expectations. Not because of the build quality, which is generally excellent. Nor due to their raw light output, which is also excellent. But because of the way that light is delivered. I mentioned following the Nemesis/LED215 comparison, that my ideal combination would be the Nemesis plus a pair of small LED light-bars on the bullbar wings, for use off-road and on tight, winding roads. This conclusion is even more valid in this case, given the HTX's very substantial price. 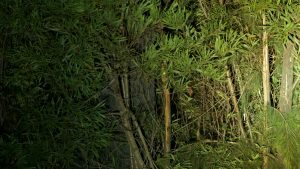 For the $1700 cost of the HTXs, you can grab a pair of Nemesis plus a pair of small premium-quality LED lightbars or pods, and still walk away with several hundred dollars in your pocket and a lighting setup that's superior in any situation.